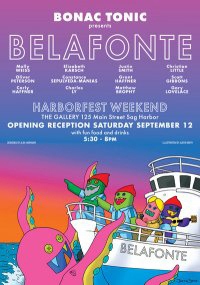 Bonac Tonic Art Exhibition from 5:00 to 7:30 p.m.
Gallery Row Art Tour at 2:00 p.m.
Street, Sag Harbor, NY 11963  725-7707 www.thegallerysagharbor.com ) will present a one-day Bonac Tonic “Belafonte” art exhibition on Saturday, September 12 from 5:00 to 7:30 p.m. The show will feature works by Grant Haffner, Carly Haffner, Justin Smith, Molly M. Weiss, Scott Gibbons, Elizabeth Karsch, Charles Ly, Christian Little, Gary Lovelace, Constance Sepulveda-Manias, Matthew Brophy, and Oliver Peterson. Booth Gallery (66 Main St., Sag Harbor, NY 11963  725-3100 www.tullaboothgallery.com will also host a free “Gallery Row Art Tour” canvassing Sag Harbor galleries on Saturday, September 12 at 2:00 p.m., weather permitting. The tour will start at The Windmill on Long Wharf and is sponsored by the Sag Harbor Chamber of Commerce. Harbor at (631) 725-7707 or visit www.thegallerysagharbor.com .